Flood stricken western province of Lorestan faces “disaster” with the lives of tens of thousands of the people being destroyed. Many homeless locals are forced into open fields with little food or warm cloths to endure the cold and wet weather. Reports indicate 150,000 people in 620 villages of Lorestan are lacking even drinking water. An official in the city of Khorramabad, capital of Lorestan Province, said 120 local villages lack drinking water. 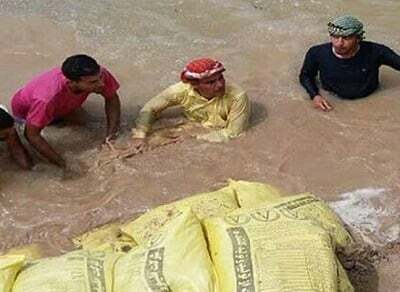 Floodwaters in the Province have caused severe damages to many rural and urban areas, most of which has been witnessed in the worst hit city of Pol -Dokhtar. There is no means of commuting to 250 villages around the city of Nurabad, according to the city mayor. A member of Iranian parliament reported from Pol-Dokhtar that many people “have spent two nights in the open fields, having fled to the mountains and have nothing”, Fars news agency quoted Hamidreza Kazemi as saying. The lawmaker appealed to government and organizations to send food and warm cloths to the area. Kazemi reported that 60 villages in Lorestan are under flood water and cut-off from the outside world. Also, half of Pol-Dokhtar and Mamulan and 20 adjacent villages are also under water. The Representative of Pol-Dokhtar in Iran’s parliament told the state-run Fars News Agency that “a number of flood stricken locals have been living in open fields for two days”. Iran has been facing major flooding which was first began in the second half of March and have struck hundreds of villages as well as towns and cities in north and west of the country, where in some places a state of emergency has been declared. The country has seen a decades-long drought but the latest flooding has also been blamed on widespread disregard of safety measures and construction of buildings and roads near the rivers. Last year, at least 30 people were killed by flash floods in East Azerbaijan province.